The question that was put was pretty simple and the options of the poll were just “Yes”, “No” or “Maybe”. 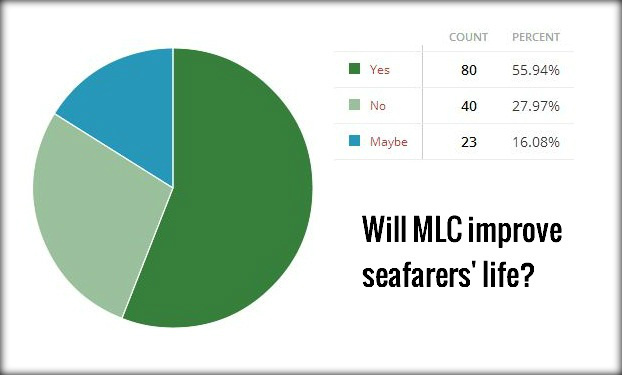 The outcome of the poll reveals that most of the people (80 of 143) that voted believe that the MLC will indeed improve the lives of seafarers onboard merchant vessel. A considerable number of the voters (40 of 143) believe that the MLC will not bring any changes in the current working conditions of seafarers and a smaller portion (23 of 143) seems to believe that the MLC maybe improve the life of a seafarer, which of course translates that the success of the MLC will depend on many variables and factors and it only remains to be seen through time. The figure below shows a pie chart of the poll. As mentioned above a lot has been written about the MLC and hopes are high about the outcome of its implementation. Indeed, ILO has shown a great deal of dedication to the MLC since its establishment back in 2006 and has devoted much of its resources for the promotion, effective implementation and rapid ratification of the convention. Among others the ILO also arranged for awareness raising seminars and workshops, training programmes, adoption of guidelines for flag and port State inspections, an action plan, ratification campaigns and two tripartite preparatory meetings. Every now and then industry media published articles, opinions and informative material regarding the MLC and industry professionals and stakeholders emphasized in their statements (in forums, meetings, events etc) the importance and the advantages of the MLC for the seafarers. Nevertheless, one thing that we must not forget about the MLC, is the fact that it was established during 2006 a time when economy was booming and therefore a lot of money wεre being channeled in various directions and to the concept of improving living and working conditions onboard vessels as well. Unfortunately times changed and the economic downturn that started during 2008 and still prevails in parts of the world (e.g. european economic crisis mainly affecting the european south) surely makes some of the industry stakeholders (mainly shipmanagement companies) to be more cautious about money spent, including those spent about the overall implementation of the MLC. So although the overall picture of the situation may seem highly promising and we surely hope that the MLC will deliver what promised, if we take a closer look there are many voices out there, some examples are highlighted below, implying that we should keep a more modest attitude since there are issues that either have not been highlighted or have been overlooked. Mr. Apostolos Belokas, Maritime QHSE expert, in one of his articles “Will ILO MLC Deliver as Promised?” brings up the issue of the MLC certificate not being a trading certificate and thus having less importance compared to other certificates. Another issue that needs to be highlighted is the minimum pay which although is addressed in the MLC, the amount of minimum pay is not clearly defined. Among others Mr. Belokas also addressed the issue of the minimum safe manning and the fact that manning levels, as set from the various flags, are unrealistic in relation to the ship’s type, size and trade. Finally a very important issue worth mentioning is that there is no clear Jurisdiction to sort out any disputes, just imagine a low rank seafarer trying to resolve a legal dispute with a shipping company based in a developed country. Dr Cleopatra Doumbia-Henry, director international labour standards department of the International Labour Office (ILO) in Geneva, stated in the Apostleship of the Sea’s 23rd international congress held in the Vatican in late 2012 that MLC could turn out to be a paper tiger if improperly used. The Marine Cafe Blog in the article “Seafarer education and MLC 2006” correctly points out that most probably there are not many seafarers that have read the entire text of the MLC. Not to mention the fact that it should certainly seem difficult for a seafarer to understand the regulatory way of writting, the terminology and the wording of the convention. In another article “No new dawn with MLC 2006: 3 reasons” Barista Uno argues on some facts about the industry that could have implications in the implementation of the MLC. For example there will always be shipowners who will try to find their way around in order not to implement a regulation if that could save them money. Seafarers fears of getting black listed because they reported an MLC violation will remain if shipowners, shipmanagers and manning agents are left freely to intimidate and harass seafarers and go unpunished. Surely we want to believe and we also hope that the MLC will gradually bring new improved standards on the working and living conditions onboard ships and to the seafarers rights as well, but the above issues should serve as a kind reminder of a well know proverb saying “actions speak louder than words” and therefore time will tell if what was written on paper was put into action in order to produce the anticipated results. Minimum age. The minimum age in order to work as a seafarers is 16. In addition if a seafarer is between 16 to 18 according to the MLC certain dangerous types of work (night work is prohibited although there can be exemptions if the flag allows it) are to be avoided and of course the company should have made arrangements in order to properly record and monitor the training program of cadets. Medical certificate. All medical certificates should be in English and each flag state sets requirements always based on the MLC requirements as well. The validity period of each certificate might vary slightly depending on the flag administration (maximum validity is two (2) years). Medical certificates for young seafarers (between the age of 16 and 18) are valid for one (1) year. Training and qualifications. As usual, this convention as well requires the training of seafarers to properly exercise their duties and of course training and qualifications should be in accordance with the STCW. Recruitment and placement. The MLC sets various requirements for the operation of the Manning Agents (Recruitment and Placement Services). Among other the practice of black listing seafarers is prohibited although a question that arises is how it can be ensured as far as practicable that such practices will stop? Another requirement that should be highlighted is the requirement for the availability of documentary evidence (in other words audits) indicating that the Manning Agents contracted by the shipping company is operating in accordance with the MLC 2006. This can be done either by the company or a more preferable practice would be to assign a third party to audit the manning agent. Seafarers’ employment agreements (SEA). Copies of the SEA and Collective Bargaining Agreement (CBA) (if applicable) must be available on board the vessel and should also be available in English. The seafarers should have one copy of the SEA. English translations of the SEA and CBA must be available on board. One point worth mentioning is that the seafarer should not sign “blindly” a SEA and should be given the opportunity (if he wants to do so) to seek for advice, e.g. from a lawyer, before signing it. Wages. An individual monthly statement of account is to be provided to all seafarers on board, showing their monthly wage and any other authorised deductions, such as allotments. Hours of work and hours of rest. One of the most important issues of the MLC since it is closely related to the development of fatigue, if hours of work are excessive and no adequate rest is provided, which is many times linked to accidents. Maximum working hours should be 14 hours in any 24 hour period and 72 hours in any 7 day period, or minimum rest hours should be 10 hours in any 24 hour period and 77 hours in any 7 day period. A flag administration may adopt implementation of the maximum working hours alone or minimum rest hours or both. A very interesting article “STCW Hours of Rest: Have You Done the Math Lesson?“, by Mr. Apostolos Belokas, analyzes the maths behind the work/rest requirements. Entitlement to leave. Minimum annual leave with pay based on 2.5 days per month of employment. Repatriation. Copy of the flag state’s provisions regarding repatriation should be available on board. Seafarers are entitled to repatriation after a maximum 12 months period as well as stated in the SEA, in case of termination for justified reasons and when they are not able to carry out their duties on board due to illness, injury, etc. Repatriation costs are covered by the shipowner except in cases of serious default of the employment terms by the seafarer. Seafarer compensation for the ship’s loss or foundering. What must be briefly stated here is that all 13 International Group (IG) Clubs have agreed to extend the scope of standard P&I cover to include repatriation in cases of insolvency and in the other circumstances listed in the MLC where seafarers are entitled to repatriation. More information can be found in the UK P&I circular for “Financial Security Requirements”. Manning levels. By having the Minimum Safe Manning Certificate one can comply with this requirement although the flag may allow exemptions depending on operational requirements and if asked so by the company. Career and skill development and opportunities for seafarers’ employment. Nothing of practical use is stated in this item of the MLC, apart from a general wording saying that national policies should promote employment in the maritime sector and to encourage career and skill development. Accommodation and recreational facilities. The convention states a great ammount of requirements about the size of cabins, the availability of recreational facilities (TV, radio etc). Vessels build after 20 August 2013 should comply with different requirements from vessels build before 20 August 2013 for which ILO No.92 and No.133 apply and therefore it would be advisable to if the vessel is built prior 20 August 2013 to have ILO No.92 and 133 certificates. Food and catering. This part of the MLC apart from requirements regarding the food and galley hygiene etc sets also requirements regarding catering staff which should be adequately trained and therefore there should be some kind of certificate from an organization recognized by the flag. Apart from this the company should have developed a relevant training programme, posters, etc.. Another issue which has been discussed in the industry about this part of the regulation is the availability of drinking water in good quality and quantity. Medical care on board ship and ashore. Seafarers should be able to access medical facilities onboard or ashore and one practical issue in terms of SMS implementation is that depending on the flag administration different form of medical reports should be used. In this item the MLC also introduces the issue of dental care of the seafarers and specific requirements. Shipowners’ liability. As already mentioned above the 13 International Group (IG) Clubs have agreed to extend the scope of standard P&I cover to include repatriation in cases of insolvency and in the other circumstances listed in the MLC. Health and safety protection and accident prevention. Most of the requirements of this items are covered through the implementation of the ISM nevertheless the new term that is being introduced is that of the Occupational Health and Safety and therefore company procedure might need some tuning along with the introduction of a relevant “Occupational Health and Safety Policy”. Another issue worth mentioning is the in this item the MLC specifies the subjects of some risk assessments that the comapny should have developed regarding for example AIDS, noise vibration. Access to shore-based welfare facilities. Shore based facilities for medical treatment of seafarers should be available from member states. Social security. As a minimum, cover for medical care, sickness and injury benefit is to be provided. Flag State responsibilities. Ths part of the MLC mainly refers to the responsibilities of the flag states that have ratified the MLC. What should be kept in mind from the perspective of someone working for a shipping company or onboard a vessel assigned with MLC implementation responsibilities is that onboard the vessel the MLC certificate along with the DMLC Part I (document issued by the flag) and the DMLC Part II (document developed by the Shipowner/Managing Company etc and reviewed by the Flag or RO) should be available. Moreover, copies two (2) copies of the report of the most recent inspection carried out by the Flag or the RO should be kept onboard, one copy to be held by the Master and one copy should be posted in a place onboard the vessel accessible by the crew. Port State responsibilities. This part of the code mainly refers to responsibilities of the port state. Refer also the OOW article “MLC 2006 Enforcement through Port State Control Inspections in Ports“. Labour-supplying responsibilities. These are requirements to be implemented by member states.